Certain tasks in Active Directory require that you start the domain controller without Active Directory running. These include restoring the database from backup, moving the database, and performing an offline defragmentation of the database. When you start the domain controller and Active Directory is not running, you must log on as the Directory Services Restore Mode (DSRM) account. The password for this account is set when you install Active Directory. The problem is, many people set this password weeks or months ago, and when it comes time to use it, they can’t remember what it is. Does this sound familiar? Here we’ll show you an easy way to reset forgotten Directory Services Restore Mode password in Active Directory 2008/2003/2000. Reset Windows Password utility can run on a CD or USB flash drive and help you remove Directory Services Restore Mode password without logging in to Active Directory. How to Reset Forgotten Directory Services Restore Mode Password in Active Directory? After you have the Live CD, bring it to boot off your domain controller whose password you want to reset. You’ll see that the computer will load some files inside the Live CD and launch the Reset Windows Password utility. 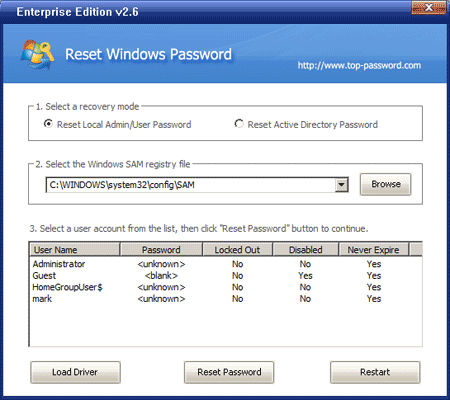 Click on the Reset Local Admin/User Password option, then choose the Windows SAM database from the drop-down list. It will display the local user accounts and you can find which account is password-protected. Choose the administrator account and then click on the Reset Password button, it will blank your Directory Services Restore Mode password immediately. Now remove the Live CD and restart the computer, you can then log in to the Directory Services Restore Mode (DSRM) account with a blank password. As it’s shown in the steps above, you can also click the Reset Active Directory Password option to unlock your domain user password if you forgot domain admin/user password. PDF Document is one of the most secure document formats because it encrypts content of document and allow user to create different type of password for different purposes. You can set password to open as well as restrict editing and printing PDF document with permissions password. To make protected PDF file you need to get a copy of Adobe Acrobat software. Adobe Acrobat Pro software lets you share documents with confidence by easily applying passwords and permissions to your PDF files. Use PDF passwords to help control document access, and apply file permissions to restrict printing, copying, or altering. Acrobat Pro lets you add a password to a PDF document to prevent unauthorized access. Anyone who knows the password can open the file, making document protection quick and easy. Open the PDF document in Acrobat Pro. Under the Advanced menu bar, select Security, and then click on Password Encrypt. You will then be presented with the Password Security dialogue box. Tick the Require a password to open the document checkbox and enter a password in the Document Open Password field. This allows us to create a password which is require to open PDF document. This password will protect document from unauthorized access. When you finish all settings click OK.
Now go to File menu and click on Save. This file will be saved at original location will all your security settings. Acrobat Pro also lets you block access to PDF document, including printing, editing, and commenting, as well as copying, extracting, or modifying content. By setting a permissions password, people will be able to read this PDF document only or have limited access to the PDF. Tick the Restrict editing and printing of the document checkbox and enter a password in the Change Permissions Password field. Now go to File menu and click on Save to save the permissions password and permission settings. In case if you have lost your PDF password to open or password to edit and print then you could not able to open or edit/print PDF file. In such situation you need to recover password of protected PDF file with PDF password recovery software. It’s always a pain: You’ve been away on vacation and can’t remember your user account password on Active Directory server. You try nearly all possible passwords, and then you remember. But by then it’s too late. Your Active Directory account is locked due to too many invalid password attempts. If you can still log in to domain controller with other administrator account, you can unlock the locked-out Active Directory user account easily while logging in. But what if there is only one administrator account on your domain controller which is locked out? Or all of Active Directory user accounts are locked out all of a sudden? You may think there is no other options than reinstalling the server. Here we’re going to show you an easy and effective way to unlock Active Directory user account without even logging in. 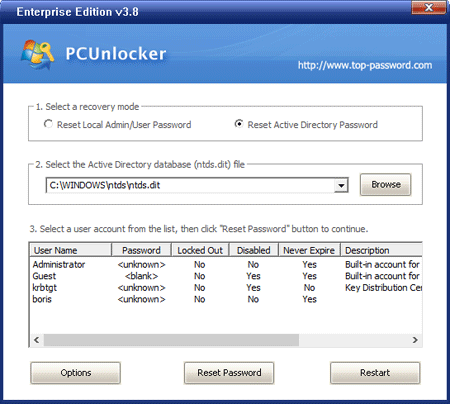 How to Unlock Active Directory User Account without Even Logging in? With Reset Windows Password utility you can easily reset forgotten domain user account passwords and unlock Active Directory user account on Windows Server 2008/2003/2000. It can help you get rid of the frustration of being locked out in just a few steps. Basically the steps involves burning a Live CD on another accessible computer, and then boot up your domain controller with the Live CD so you can unlock Active Directory user account without even logging in. After you have the Live CD, bring it to boot off your domain controller whose password you want to unlock. You’ll see that the computer will load some files inside the Live CD and launch the Reset Windows Password utility. Click on the “Reset Active Directory Password” option, then choose the Active Directory ntds.dit database file from the drop-down list. It will display the domain user accounts and you can find which account is locked out. Choose a user account and then click on the Reset Password button, it will unlock your domain account and also change the password to a new one: Password123. Now remove the Live CD and restart the computer, you can then log in to your Active Directory user account with the new password. The unlocking procedure takes you less than two minutes. While you may be out of luck if you spend a lot of time to search tips and tricks to unlock Active Directory user account. 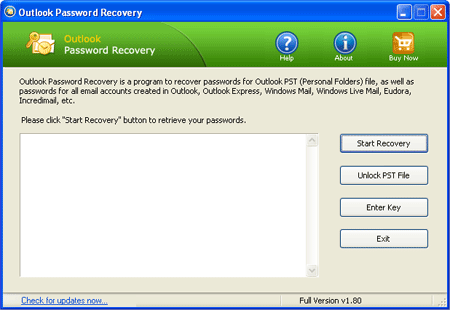 Most of Windows password recovery software can recover passwords only for Windows local account. None of them can work with domain controller and allow you to unlock Active Directory user account. Have you ever tried to delete a file and you receive the “Access Denied” error message? This error is quite common and you’re not alone. The problem can occur due to many different reasons, maybe the file is being used by some other programs, you do not have administrator privileges, or maybe you are trying to delete a file on a write-protected disk. You know how frustrating such error message can be. Fortunately, there is a small freeware that can help to fix the access denied error so you can delete your files without any hassle – Unlocker. 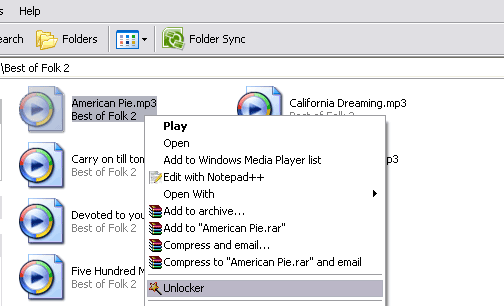 This software lets you see which process is holding the lock on the file/folder and then helps you unlock it. After Installing this software you can simply right click the file/folder that is giving “Access is Denied” or “File May Be In Use” errors and then click on Unlocker. A new window will now pop-up showing the processes as shown below. Now you can either unlock all of the processes or kill the process. On the left of the ‘Kill Process’ button there is a drop-down menu where you can select Copy, Move, Rename, or Delete functions for a locked file. The easiest and most straightforward way to hack Windows 7 password is to use a password reset disk. The problem with this option is that you have to create the reset disk before the password is lost. Thus if you don’t have a password reset disk, this option is not for you. 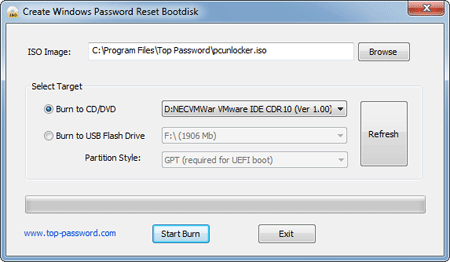 With the third-party software – Reset Windows Password, you are allowed to create a Live CD which can be used to boot your locked computer and hack Windows 7 password in no time. Before we begin, you need to prepare an empty CD and make a password hacking Live CD on another computer you have full access to. Later set your locked computer to boot from the Live CD and hack the forgotten/unknown password. Here are the step-by-step instructions. How to Hack Windows 7 Password The Easy Way? Place the Live CD you’ve created in the CD drive of your computer with a password you want to hack. Head into the computer BIOS and set your computer to boot from CD. Remove the Live CD and restart the computer. You can then log in to the computer without being asked to enter Windows login password, as you’ve successfully hacked Windows 7 password and replaced the forgotten password with an empty password. Hibernation is a great way to cut down on the computer’s power consumption when it’s not in use. It also helps save battery on the laptops. When the computer is in hibernate it lets you save all the data in RAM to hard drive persistently and switch off the computer. Then you can switch on the computer with exact same settings and opened applications. When you enable hibernation, it creates a file: hiberfil.sys, located on your root system partition which saved the state of all open documents and files. The file size of hiberfil.sys is about the size of your physical memory. So it would consume lots of hard disk space. If you never plan to put your computer into hibernation then it’s probably a good idea to disable hibernation and gain all the disk space back. Here we’ll show you how to disable hibernation using Command Prompt in Windows 10, 8, 7, Vista and XP. How to Disable Hibernation in Windows 10, 8, 7, Vista and XP? Go to Start Menu -> All Programs -> Accessories -> Command Prompt, right-click on it and select Run as Administrator. In Windows 8/10, press Windows + X to open WinX menu, then select Command Prompt (Admin). Press Enter key, this will disable the hibernate feature. Now restart the computer, you won’t be able to see hibernate.sys file in your system drive. If you can still see it, simply delete it. Now you have successfully disabled hibernate and free the hard disk space. 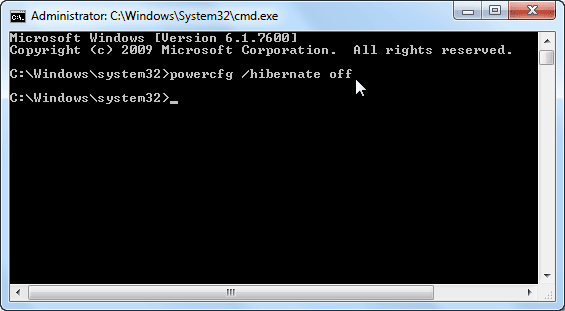 If you want to enable hibernation again, you can use the same method above to open an elevated Command Prompt with administrator rights, then type the command: powercfg –h ON to enable the hibernation. My son cannot remember his Windows Vista login password on his laptop and we do not have a reset disk. Short of taking it to a repair center, is there any way he can crack the password himself? Forgot Windows Vista password? It’s truly that computer users have a tendency to forget the administrator password. If you can’t recall the original password, you’ll be stuck at the login screen. In this article I’ll show you how to crack Windows Vista password with a USB drive. In the event that you forget your password, you can easily use the USB drive to crack the password and log onto your computer. How to Crack Windows Vista Password with USB Drive? Download the Reset Windows Password utility onto an accessible computer. Unzip the download file, you’ll find an ISO image file: ResetWindowsPwd.iso. Burn the ISO image to your USB drive using ISO2Disc tool. If you have important data on your USB drive, I recommend you make a backup firstly. The burning procedure will format the USB drive and erase all data on it. Plug your USB drive in to your Windows Vista computer whose password you want to crack. Go into the computer BIOS and set USB device as the first boot device. Turn on your computer and it will then boot from your USB drive. After a while, it will launch the Reset Windows Password utility. On the screen, choose your desired user account and then click on the Reset Password button. It will blank your forgotten password immediately. Unplug the USB drive from the computer and restart it. You can then log on to Windows Vista system with a blank password. That’s all! If you want to set a new password for your computer to prevent unauthorized accessing, ensure that the password you are going to set is convenient for you to remember and will not be lost again.